The Marble Ganesha Statue offered by us with smooth edges and fine finishing are designed in different size, pattern and color. Carved from quality marble stones, the Ganesh God Statue is dexterously chiseled and gives a ravishing looks. To meet our client’s expectations we take extra care towards every single detail of carvings, weight and finishing of our range of Ganesha statues. 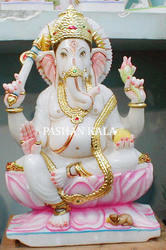 Ganesha moortis offered by us can increase the beauty of the interior and offers a religious feel in the room. We are presenting our client various kind of Marble Krishna Statues with Cow in white stones which are widely known for their premium quality, perfect finish, fine polishing and long service life. Scrupulous carving of these Krishna with Cow is done by our expert craftsmen and these are provided in various designs and patterns. We are one of the leading organization engaged in providing excellent quality Hanuman Statue, which are manufactured by using high grade material. 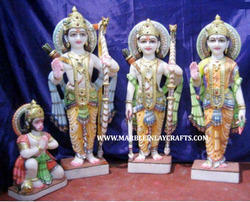 These Marble Hanuman Statues are widely appreciated by our client which are situated all round the nation. High in demand, these Hanuman are available at most reasonable price. We offer a wide range of Beautiful Marble Ram Darbar Statues, available in contemporary styles which impart beauty and character to home, office and hotel. Use of pure marble is done for processing purpose. Creative talent of our craftsmen help us in posturing and carving of Ram Darbar Statues with a clear display. We can customize the statue on the parameter of shape, sizes and postures as per the client specification. 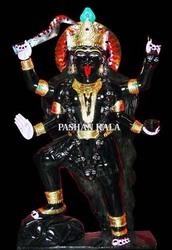 We bring for our client our exquisite pieces of Black Marble Kali Mata Statues. These idols are true reflection of goddess kaali. Carved from black color marble, these Kaali Maa Idols have smooth finish. The offered range is available in various pattern, size and dimension. In addition, these are highly praised by the international client. We put forth a high quality and finely carved range of Marble Lakshmi Statue. 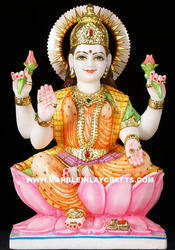 Its beautifully depict Goddess Laxmi the goddess of wealth, fortune, beauty fertility and auspiciousness. Our skilled craftsman duly paints every sculpture with utmost finesses. The cuts are fine, edges smooth and impeccably carved. We ensure through several tests that it is resistant to weather and cracks. Owing to its eye captivating designs and magnificent surface finish, this range is highly valued among our patrons. 12, 15, 18, 21, 24,27,30, 33, 36, 39, 42, 45, 48, 51, 54, 57, 60, 63, 66" inches height etc. 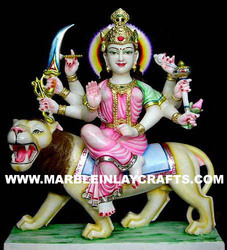 We also provide an extensive range of Marble Durga Mata Statues to our client as per their requirement. This Durga Statue is carved using best grade marble and ideal to keep in worship room. 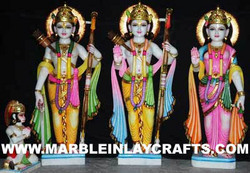 Our range of statue is fully colored by our experienced professionals and acknowledged for highly finishing. 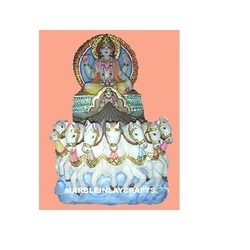 We offer this Marble Durga Statue at competitive price. The offered range is available in a wide variety of design and size. 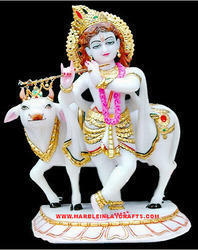 We are presenting our client beautiful range of Marble Ram Darbar Statue. Client can avail elegantly crafted statue of Lord Ram Darbar which is widely placed at the time of various religious activities. Crafted using high quality raw material and optimum crafting methods. 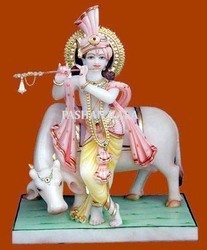 All hindu families keep at least one representation of Ram Darbar in their home..
We are known as a trusted manufacturer, exporter and supplier of an artistically designed range of Marble Statue Krishna With Cow. This range is widely acclaimed for use of high grade raw material. It has been carved out of white marble and beautiful color is used with utmost precision. Our range is demanded in commercial, religious as well as residential establishments. 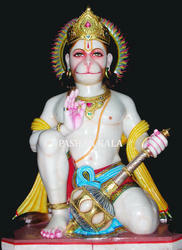 We are engaged in offering a wide range of Marble Hanuman Statue Standing to our most valued client. Our range of God Hanuman is made from quality raw material and also display our craftsman aesthetes in real way. 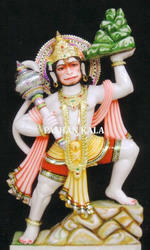 These Lord Hanuman Statues are available in various size and we offer at most competitive price. Looking for Marble God Statue ?